BaseballThink has relocated to www.baseballthink.com. Come visit us in our new digs. We've discussed timing the pitcher and creating the gap. 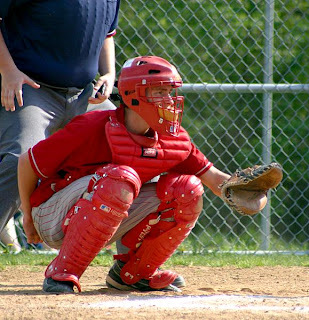 In our final installment on stealing 3rd, let's talk about the catcher. When you deem the timing is right to steal third base, look to the catcher before bolting. How strong is the catcher's arm? What pitch is the catcher likely to call (easier to steal on an offspeed pitch)? And....where is the catcher setting up? If the catcher is setting up inside on a righthanded hitter, it could be more difficult for him to get a throw off as the batter will obstruct the throwing lane to 3rd. If there is a lefthanded batter at the plate, it really opens up the throwing lane for the catcher. Lots to think about. As you play more, you will be able to collect all this information in your head in a matter of seconds and make a good decision. In our first installment on stealing 3rd, we spoke about timing the pitcher. In Part 2, we will talk about creating a gap. By stealing 3rd base, one thing you are doing is opening up a larger hole on the left side of the infield, as the 3rd baseman needs to vacate his position to cover 3rd base. 1. The hitter has a tendency to hit the ball that way. 3. It's a hitter's count (1-0,2-0,2-1,3-1) when a hitter is in an aggressive mode at the plate. If your team is in the field, you might consider holding the 3rd baseman in position and conceding 3rd base. You would probably only do this when there are 2 outs and you believe there is a high likelihood that the batter will hit the ball in that gap. Stealing 3rd base is something that amateur and scholastic teams should be doing more often. It's all about finding the right opportunities. Consider this posting the first in a three part series about stealing 3rd. 2. Count the seconds from the pitcher's set position to the start of his motion. 3. Look for a movement the pitcher makes that jumpstarts his motion. Sometimes a pitcher will tuck his chin or bob his head slightly. The effectiveness of this approach is increased even more when the 2nd baseman and shortstop are not paying much attention to the runner at 2nd. Rule of Thumb: Don't make the 3rd out trying to steal third. Most likely, you will score from 2nd base on a 2-out base hit anyways so the reward of getting to 3rd is not nearly as great as when there are less than 2 outs. I'm not saying not to steal 3rd with 2 outs. I'm just saying that if you go, you better be safe! If you consider it somewhat of a risk, steal with 0 or 1 outs. Then, you have the added reward of being able to score from 3rd on a sac fly or infield grounder. 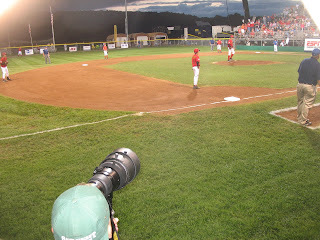 I attended the Mid Atlantic Championship game of the Little League World Series last night. The winner advanced to the main event in Williamsport, PA. One thing I took away from the game was the pure joy of the kids. They are out there playing for the love of the game. If you find yourself getting frustrated with the game because of personal or team struggles, I recommend taking in a little league game to make yourself realize why you are playing this great game. My amateur baseball team has had a number of rainouts in the past few weeks. Because the weather has been so unpredictable, we have actually made the trip to the field before the game has been postponed. With our whole team at the field and no game in sight, what should we do? Does anybody have any suggestions on productive ways a team can use this time? Before almost every game, a team will take a round of infield/outfield as a tune-up. It's a chance to get the blood flowing, get a feel for how the ball is going to bounce, and perhaps practice seeing the ball against a tough sky. There is a key player often absent from this routine...the pitcher. During the course of the game, the pitcher is often called on to field a groundball. The pitcher is required to make some very tough throws at times as well (e.g. starting a double play up the middle OR throwing to a moving 2nd baseman covering 1st on a bunt). Are we missing something here? Why is the pitcher traditionally left out? Get the BaseballThink widget and many other great free widgets at Widgetbox!